A spokeswoman for the Diocese of Brooklyn, of which the cemetery is a part, says it plans to "vigorously dispute the nature of the suit"
A 64-year-old Long Island woman is suing a local cemetery for traumatic brain injuries, PTSD and other problems she says she suffered when a sinkhole allegedly nearly sucked her into her parents' grave during a 2016 visit. Joseph Perrini, an attorney for the woman, Joanne Cullen, confirmed his client is suing St. John’s Cemetery Corp., which runs the St. Charles and Resurrection/Cemeteries where her parents are buried, for $5 million over the alleged December 2016 nightmare six days before Christmas. Court papers cited by The New York Post claim Cullen leaned over to adjust a wreath by her parents' shared headstone and suddenly found herself sinking. She fell forward and smashed her head on the tombstone, leading to a cracked tooth. Then, her attorney claims, she grabbed onto the headstone to keep from sinking further and ended up hip-deep. Perrini told News 4 a grave next to to Cullen's parents' apparently had some kind of void in it that created the sinkhole. 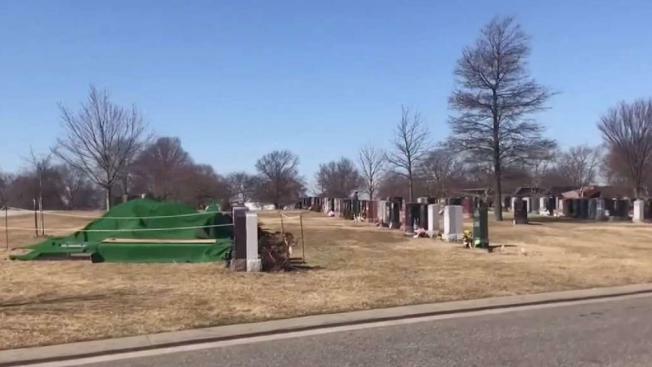 "Getting sucked into your parents’ grave when you go to visit them on a cool December afternoon with the sun going down … it’s terrifying and traumatizing,” he told the Post. Cullen is now afraid to go back to the cemetery, fearful of walking in open, grassy land and suffers from headaches and nightmares, Perrini told the paper. She also needed counseling, he said. The lawsuit was filed in Queens Supreme Court. In a statement Tuesday, a spokeswoman for the Diocese of Brooklyn, of which the cemetery is a part, said the cemetery "plans to vigorously dispute the nature of this lawsuit."